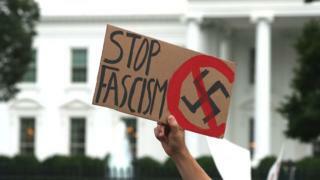 Decisions by Google, GoDaddy and Cloudflare to eject a neo-Nazi site from their services were "dangerous", a US-based digital rights group has said. The Daily Stormer had denigrated 32-year-old Heather Heyer who died while protesting against a far-right rally in Charlottesville. This led to a backlash in which multiple web firms kicked the site off their platforms. But the Electronic Frontier Foundation (EFF) has now criticised this response. "We strongly believe that what GoDaddy, Google, and Cloudflare did here was dangerous," the EFF said. "Because internet intermediaries, especially those with few competitors, control so much online speech, the consequences of their decisions have far-reaching impacts on speech around the world." It added that it believed "no-one" - including the government and private companies - should decide who is able to speak or not. "We wholeheartedly agree with the concerns raised by the EFF," said Cloudflare chief executive Matthew Prince. "They reflect the same concerns we raised in our blog." Mr Prince had said that explained that he made his decision after the Daily Stormer's administrators suggested that Cloudflare supported their cause. Google and GoDaddy said earlier in the week that they were cancelling the Daily Stormer's registration with Google Domains as it had violated the terms of service. The Daily Stormer is currently inaccessible on the open web, after various domain providers and hosting firms - including one in Russia - banned it from their services. However, it has relocated to the dark web. Dark web network Tor has said it cannot stop the Daily Stormer from using its technology. "Tor is designed to defend human rights and privacy by preventing anyone from censoring things, even us," the Tor Project explained in a blog post. But the list of businesses that have shut out the Daily Stormer and other neo-Nazi or white nationalist sites has now grown very large. Payment giants Mastercard, Visa , Paypal and American Express all said this week that they would take a tough stance on sites that engaged in illegal activities. Paypal, for example, mentioned sites that incite hate, racial intolerance or violence. And music streaming services offered by Google, Deezer and Spotify have said they would remove music that incites violence, hatred or racism. Spotify said: "We are glad to have been alerted to this content - and have already removed many of the bands identified, while urgently reviewing the remainder."